Seismic methods use sound (generally P-waves) to image structural and stratigraphic features. Two-dimensional (2D) seismic data are cross sections through the earth; 3D data are volumes of digital data that, through the marvels of computer graphics, can be visualized in a variety of ways. Most seismic data are collected by the petroleum industry, although other datasets are collected for civil engineering purposes (e.g. aquifer mapping or shallow hazard detection) and academic studies (e.g. deep-crustal imaging). You can become a better field geologist. Modern interpretation software allows interpreters to cut through and view 3D seismic data from any direction. For example, faults can be viewed in vertical strike, dip, or oblique orientations, but they can also be viewed on horizontal slices through the data. Even grids of 2D seismic lines cut through structural and stratigraphic features in a variety of orientations. Would you recognize a strike transect through a normal fault as such if you saw one in an outcrop? What does a transect down the axis of an incised valley look like? Working with seismic data will help to train your eye to recognize structural and stratigraphic features in any orientation. 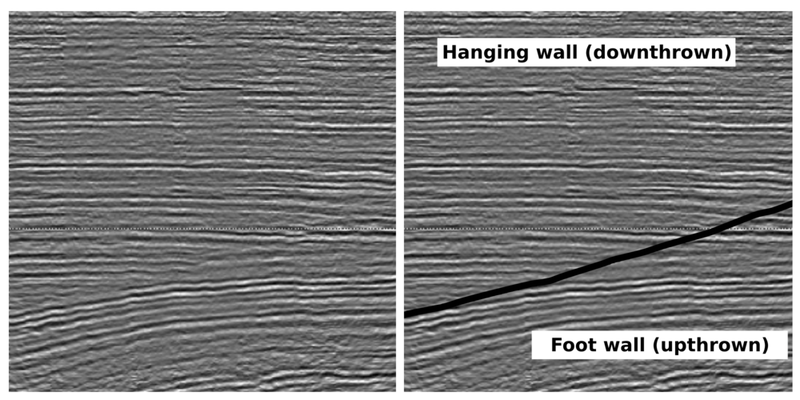 Below is a listric normal fault on uninterpreted (left) and interpreted (right) strike-oriented transects from a 3D seismic volume. Displacement of the hanging wall is directly towards the viewer, but the sense of movement cannot be determined from this view. The angular discordance between reflections and reflection terminations could be misinterpreted as an angular unconformity. You can see more. Seismic data almost always allow you to see more of a structural or stratigraphic system than can be seen in even the most continuous outcrop. There is a lot of geological knowledge to be gained from this big-picture perspective. For example, depositional models for submarine fan systems were revolutionized once high-quality seismic data became available (see What are turbidity currents?). The original facies models were mostly developed using outcrop data, but seismic data later revealed that outcrops usually only showed small portions of much larger depositional systems. Similar advances have been made in structural geology, for example helping map linkages of fault systems. You can map more. You can nearly always make subsurface maps more quickly and more accurately with seismic data than without it. Mapping stratigraphic features (such as channels) or structural features (such as faults) using well control alone is an exercise in connect the dots — each geologist will generate a different product based on his or her biases and abilities. Seismic data, especially 3D seismic data, provide continuous data coverage between wells, virtually eliminating the guesswork involved in mapping solely from well control. Your career options will be enhanced. It’s no secret that most geologists (perhaps excluding academics) work in a boom-and-bust world. Many are the geologists who, over the course of careers spanning a few decades, have changed fields (e.g. petroleum geology to hydrogeology or vice versa) to stay employed. Adding another tool to your kit is never a bad thing. It can be fun. Most, but admittedly not all, geologists exposed to digital seismic interpretation have come to enjoy working with the software and data. Despite these advantages, there are of course limitations. For example, in typical data, stratigraphic features need to be at least 10 m thick before they can be resolved; trace-fossil enthusiasts will be disappointed. There can also be geometric distortions to structural and stratigraphic features. To help overcome these and other limitations, and to reduce the ambiguity inherent in working with any single type of data, seismic data need to be integrated with other sources of knowledge — core, wireline logs, outcrop analogs, and so on — during interpretation. that integration effort, in itself, can be an enlightening and enjoyable exercise. Image reproduced with permission from: Hart, B S (2011). An Introduction to Seismic Interpretation. AAPG Discovery Series 16, CD-ROM. Bruce Hart is currently a research geologist at Statoil in Houston, Texas. He previously worked for ConocoPhillips, McGill University, New Mexico Tech, Penn State, and the Geological Survey of Canada. He has taught seismic interpretation courses since 1995 in Houston, Calgary, London, Cairo, Copenhagen, Kuala Lumpur, Vienna, Denver, and elsewhere.